NAHA, OKINAWA PREF. - The government began constructing a new sea wall Monday in Okinawa as part of a controversial plan to relocate a U.S. military base within the prefecture, the local defense bureau has said. The move is expected to draw fresh backlash from the Okinawa Prefectural Government, which has persistently opposed the Japan-U.S. plan to move U.S. Marine Corps Air Station Futenma from the crowded residential area of Ginowan to the less populated coastal zone of Henoko in Nago. Under the plan, some 157 hectares of land will be reclaimed to construct a V-shaped runway. The sea wall, which will be 135 meters long and located on one side of the planned landfill site, is the eighth area in which the central government has started construction work. The move came after a meeting of experts assessing the environmental impact of the base relocation concluded last Tuesday that the fresh work would not affect corals inhabiting the area. Multiple areas on the eastern side have been found to require additional seabed reinforcement work, but they are located apart from the construction site for the latest sea wall. 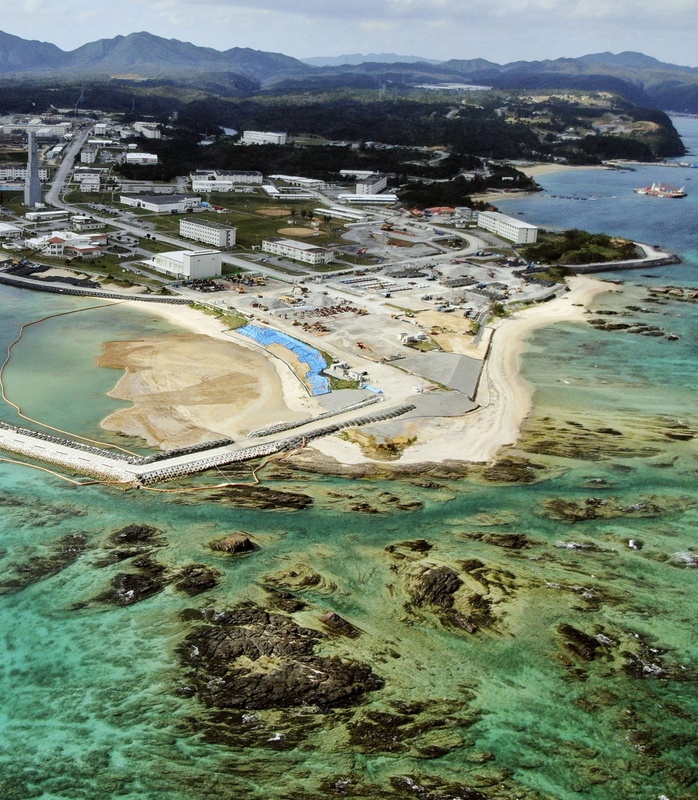 With the Okinawa Prefectural Government unlikely to approve the reinforcement work, the state has set out to build a sea wall on unaffected areas first. The central government also plans this spring to start building a new 515-meter-long sea wall next to the one for which construction began Monday, and to use both sea walls as piers for vessels transporting soil and sand for landfill work. 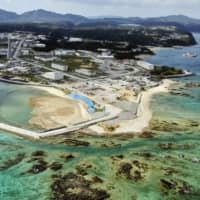 The Okinawa government, which wants the base to be moved out of the island altogether, is seeking an immediate halt to sea wall construction. It aims to demonstrate its opposition to the planned base transfer by holding a prefectural referendum on the matter in February. After decades of hosting the bulk of U.S. military facilities in Japan, many Okinawa residents are fed up with the noise, crimes and accidents linked to their presence. Prime Minister Shinzo Abe’s administration claims the plan is the only solution to remove the dangers posed by the base without undermining the deterrence provided by the Japan-U.S. security alliance.